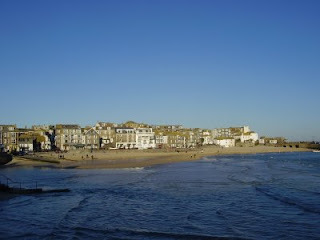 After several days of cloud we've finally got some beautiful sunshine and clear blue skies in St Ives. Here are some photos taken this afternoon. I hope nobody minds – but I can’t help stereotyping some of our wonderful visitors. Visitors arrive all through the year and tend to fall into various groups. As the usual convoy of 4 x 4s (SUVs whatever ?) crawls down Tregenna Hill this is definitely …... Middle Class Mummy Week ! With little Toby and Pandora safely strapped in the back of the Landcruiser, Hugo works as a producer for the BBC (so credit crunch proof ! ), Sarah teaches Reiki and is a stalwart of the local NCT in Islington. 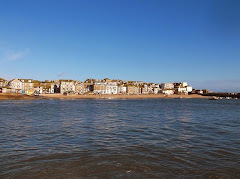 New Labour to the core they adore quaint St Ives. With the smoking ban in place they can now safely pop into The Kiddleywink without risk of death (probably still won’t venture into The Three Ferrets just yet though) for a glass of white wine before heading back to the apartment on Porthmeor. 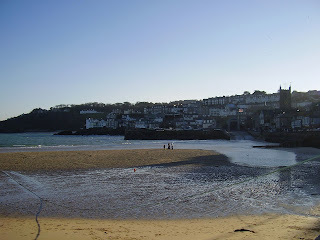 They can then leave their babysitter to tuck in T + P before heading out to Porthminster Beach Café or Alba. Thinks that The Sloop is an authentic locals pub. Just thought I'd give you a quick preview of the events planned for the 2009 festival. 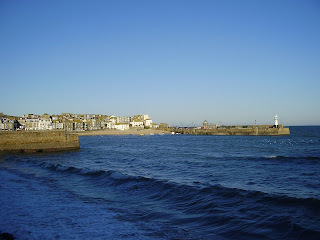 2008 saw the first St Ives Literature Festival and was a great success. I popped into The Salt House Gallery a few of days ago to see Bob Devereux the organiser. The planned dates for 2009 are Saturday 2nd to Saturday 9th May. No events are fixed yet but there will no doubt be opening and closing parties on the two Saturdays. Poetry in the Square will take place daily in Norway Square or The Salt House if wet. Charles Shaar Murray and Anna Chen will be here. Hopefully we'll get to enjoy "Everything I Know About Rock and Roll Part Two" from Charlie. Also Anna's poetry and readings. The usual local stalwarts will no doubt put in an appearance somewhere - Rod Bullimore, Kelvin Bowers, Bernie Davis and more. Plus of course the inimitable Bob himself ! Discussions are going on with a number of publishers, writers and poets. 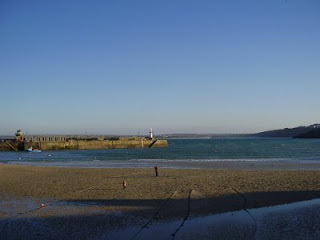 Happy Christmas From St Ives ! I love Christmas here ! We used to come down every year before we moved. Always stayed in Baileys Lane. apart from my usual last minute panic about something I've forgotten. Luckily the Co-Op and McColls are open until fairly late. Town seems much quieter than last year - definitely fewer visitors. At least that means less queueing in the shops. There is even space to park in Bedford Road right now. Devoid of the usual mass of 4x4s and BMWs. There's a little bit of blue sky appearing this afternoon. Forecast for tomorrow is cloudy but dry. Weather can change very quickly here so might see the sun. I've embarked on a major redesign of my OneStIves website. I'm aiming for a cooler graphic design, easier to navigate. I'll also be adding more content to the site. More town info, pictures, articles, videos, news. This is an early prototype so most of the links don't work yet. Any feedback, comments, ideas are welcome. Also let me know if you'd like to contribute any content of your own. I've begun my annual trawl through Google and MySpace for 2009 festival gigs - to feature on my OneStIves website. All I've come up with so far is Bellowhead, opening the programme at The Guildhall on Saturday 12th September. Pretty good band so I've heard, so may check them out, depending on the ticket price. As ever the "official" festival web site has a wealth of information - gigs, events, exhibitions, talks - for LAST years 2008 festival ! My guess is that the rest of the Guildhall programme will be the usual solid if slightly dull mixture of blues, folkies and trib. bands. If it was up to me and if I had the money right now I'd be booking Lacuna Coil, Dragonforce and Chimaira - but it isn't and I don't. The chances of the promoters putting anything on for young people (and sad middle aged metalheads like myself) remain slim. I spoke to Bob Devereux a couple of days ago and Poetry In The Square will be going ahead as usual. He may be away for the first week of the festival so guest comperes may be required including my great friends Rod Bullimore and Anna Chen. The Festival Committee will probably hold back until their "big splash" programme release in the spring. No doubt hoping that they can secure some last-minute groundbreaking big acts such as Rolf Harris or Rod Hull and Emu. Many may not be aware - as its not mentioned on their website - that the festival is starting later in the month next year - it runs from Saturday 12th to Saturday 26th September. 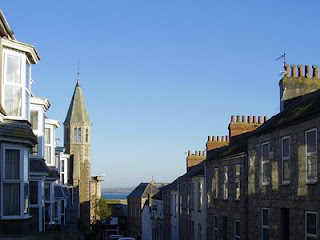 I'll keep the OneStIves festival page updated as I discover more gigs. Let me know of any gigs and I'll feature them. Like many small towns we will be bidding a sad farewell to Woollies after Christmas, leaving a big hole on Fore Street. No rumours at all so far about who might take over the site. No doubt the perennial rumours about Gordon Ramsay / Rick Stein / MacDonalds moving into St Ives will resurface in the New Year. This was one of the last places in town where you could buy reasonably priced practical items such as saucepans, bed linen and stationery. Most here reckon the main benefiary will be Colin at Colenso's on Gabriel Street. He's a brilliant salesman and claims that "if we haven't got it you don't need it". Its the sort of place where you go in intending to buy a ball of string and emerge with full set of screwdrivers, a foot pump and a tin of paint. Great stuff though and one of the last outposts in St Ives selling useful items. Our walk along Fore Street on Wednesday evening was quite scary - getting on for half the shops have sales on with heavy discounts - and this is the week before Christmas ! Thanks to our Scottish friend Mr Broon (sorry .. I meant the world economy .. nothing to do with him .. its those American banks) it looks like being a tough few months ahead. More updates on the St Ives shopping situation soon.